With over 30 million Americans suffering from dry eye disease, blepharitis, and meibomian gland dysfunction (MGD), it's no wonder that countless companies are turning their sights toward hypochlorous acid eyelid cleansers. OcuBliss, a brand new company to the eyelid hygiene space, has released their OcuBliss Daily Cleanser. The 0.018% pure hypochlorous acid solution is safe for daily use, as it is free of oil and alcohol, and it contains no sulfates, parabens or added fragrances. Without the cost of a prescription, this new OcuBliss solution delivers effective results for those with styes, dry eyes, MGD, blepharitis, and red, itchy eyelids. Hypochlorous acid is a natural, bactericidal component of the body's immune system, meaning that it eliminates bacteria. When the immune system recognizes pathogens, it naturally releases hypochlorous acid to fight the bacteria. Hypochlorous acid has shown super effective in-vitro efficacy against a wide range of pathogens (including Strep and MRSA) which helps fight infection, control inflammation, and enhance the body's natural ability to heal. Hypochlorous has 100 times the cleaning power of bleach, but is as gentle as distilled water. 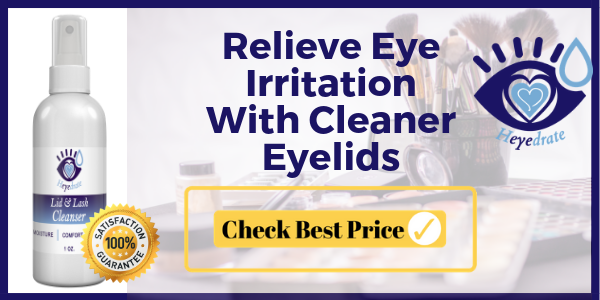 With the known benefits of this substance, many companies have begun to produce it themselves and it works great as an eyelid cleanser for everyday eyelid hygiene maintenance. The use of this 0.018% hypochlorous solution is simple. Twice per day, spray the solution onto closed eyelids and let dry. You may use a cotton ball or round for application, or you may rub it in after spraying it on. Either way you decide to use it, you'll surely find lasting benefit. There is no need to rinse this solution off, and it should not irritate the eyes of most users. As stated previously, OcuBliss, as well as other hypochlorous acid cleansers on the market, have very few side effects. 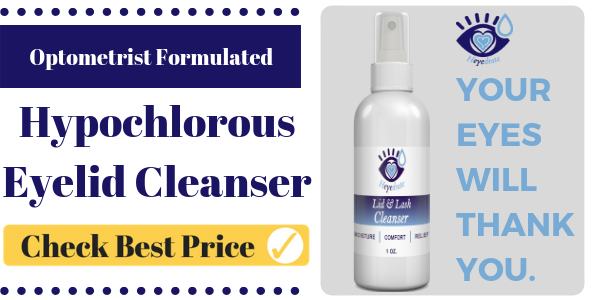 Essentially, this solution works to eliminate contaminants on the skin due to its bactericidal properties and it does so without many side effects. No tingling, burning, or stinging is usually noted. However, as with anything, it may burn if the user has extremely inflamed and irritated eyes or eyelids. This is a possibility and does not necessarily mean that you're allergic to the solution. If you do have a reaction, it may just be that you need to continue using the spray and give your eyes and eyelids time to heal more thoroughly. You can rest assured that it's working to heal your inflamed eyelid conditions! OcuBliss' new hypochlorous acid cleanser is available in a 30mL bottle. Thankfully, this effectiveness comes without the cost of a prescription! On their website, you can purchase the 30mL size for $34.99, and it is also available in some doctor's offices. This is a bargain when you compare it to other prescription cleansers which can cost up to $300 per month. Our Heyedrate Lid and Lash Cleanser tends to be less than this. Click here to check price of Heyedrate on Amazon. Overall, we believe this is a great price and well worth it when you consider everything hypochlorous acid can do for you and your family. Keep in mind that it's not only about dry eye, blepharitis, and MGD. This can be used on everything from sunburns and scrapes, to scars and other skin inflammation. At this point in time, there are quite a few alternatives to OcuBliss that you may consider purchasing. We especially want to highlight our Heyedrate Lid and Lash Cleanser, because we believe it to be a wonderful, effective, and pure alternative. Keeping the eyelids clean is the best way to eliminate the symptoms of dry eyes and prevent it from recurring. Use of a hypochlorous acid based solution cleans the eyelids to decrease the growth of bacteria and promote proper oil production for the eyes. We recommend using our Heyedrate Lid and Lash Cleanser twice daily as maintenance of healthy eyelids and lashes. Simply spray the solution onto your closed eyelids, rub in, and let it dry. It's that simple! The 1 oz. Heydrate Lid and Lash Cleanser is currently available on Amazon and our website for less than $20, and the 4 oz. bottle can save you some money and can be purchased for around $50. Since it's such a new product, OcuBliss doesn't have a ton of reviews yet, but it does have enough to let you know that it's effective. Most hypochlorous acid formulas are similar, give or take a few minimal dosage differences, and this formula performs well for most people. Similarly, the Heyedrate Lid and Lash Cleanser has hundreds of positive reviews both on Amazon and our website, showing the effectiveness of hypochlorous acid in general. We expect that, as time goes on, OcuBliss will garner similar reviews. That being said, there will always be someone who will react negatively to the product for whatever reason. Because this product is often used on inflamed eyes and eyelids, it has the potential to burn if there is severe inflammation there. This sensation is only temporary, and it will subside once the inflammation is under control (which the product will help to achieve). Since we've covered both OcuBliss and Heyedrate, let's talk a bit about prescription versions of hypochlorous acid. Avenova is the first prescription, FDA-approved, non-detergent based, non-antibiotic product shown to be successful in the treatment of such common eye conditions as blepharitis, MGD, and dry eye. We used this in our clinics for over two years and had great results! We now use the Heyedrate Lid & Lash Cleanser for our patients, due to a lower price and the fact that it is over-the-counter. Since patients can purchase online with ease, such as on Amazon, compliance is generally greater and patients see better results due to consistency. Overall, Avenova is a great product and we always recommend that if your doctor has prescribed it for you and it's working, you continue using it. No matter what hypochlorous acid formula you decide to use, you're going to find that it is effective at cleansing your skin and preventing some of the irritating eye conditions we come across. If you've found one that works for you, let us know! If you're searching for a new one to try, we hope we've given you a few options to think about. Try Our Heyedrate Lid and Lash Cleanser Free, Just Pay Shipping. Click the button to claim your free 1 ounce bottle of Heyedrate Lid and Lash Cleanser, just pay shipping!